Over the last two or three years a number of schools have implemented the Scribing technique. The county of Longford piloted the project, but schools in Leitrim, Sligo, Rosscommon and West Meath are also using Scribing. National Schools have introduced Scribing into senior classes where children scribe for each other. Children of all abilities flourish with the ongoing support and collaboration. This is especially significant with reluctant or disadvantaged young writers. Even skilled young authors welcome the creative freedom that comes from having a Scribe. It encourages quality task based talk, active listening and the "Story Inspirations" make introducing the technique simple. Ten to twelve year olds - have been very effectively trained to act as scribes for younger classes. It is a real "buzz to see twentyfive or more eleven and twelve year old boys and girls each sitting in an infant classroom with a young Author excitedly recounting a story. The scribes quickly develop a sensitivity that is a delight to see. And there is a never more than a quiet working hum even in very crowded conditions. Infant and lower junior teachers find that the extension sheets, provided for a whole class allow them to write with individuals or small groups. Hearing a child listen to their Scribed story read back always illustrates clearly the pride they always take in these stories. Scribing has proved to be an ideal homework activity. Parents enjoy the quality time spent writing with their children and the "Story Inspirations" make it stress free. Once parents understand that a Scribed story is a valid way of working they notice the difference. Many parents have reported back that previously reluctant children begin to have confidence to write for themselves and that their READING improves as well. Resource teachers and Home Liasion teachers are finding Scribing extremely useful. 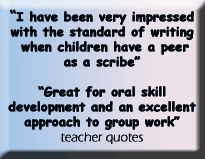 Either on a one-to-one basis or encouraging parents to get creatively involved with their children's writing, Scribing is making a difference. Secondary schools have successfully used Scribing with 1st and 2nd year English classes. Again resource and Home Liasion teachers find it an effective approach. Results with Special Needs groups, both children and young adults, has been extaordinary. See the Penfriends Project or The Gallery for examples. WOULD YOU LIKE SOME IDEAS FOR INTRODUCING SCRIBING INTO SCHOOL?